GIVE ME THAT OLD TIME GOSPEL. Although the Gnostics had their own “gospels,” such as the Gospel of Philip and the Gospel of Truth, they were all written later than Matthew, Mark, Luke, and John, and none of them were ever considered Scripture by the majority of Christians. (See No Other Gospel) They are not gospels in the same sense as the canonical gospels: They do not chronicle the life of Jesus and are not primarily concerned with historical events but with spiritual advice, revelations, and explanations of the Gnostic view of the cosmos. THE DIVINE SPARK. Gnostics believed they were the elect, spiritual ones who alone had the “seed” of the divine trapped inside their earthly bodies. Salvation for them meant escape from the material world. Some Gnostics believed in reincarnation for imperfect souls who might have another opportunity in this world for salvation through knowledge. MARY, MARY. Since the 19th century, Gnostic writings have been popular among some feminists because they seem to give greater prominence to women than the traditional Christian church has done. The Gospel of Philip and the Gospel of Mary depict Mary Magdalene as uniquely loved by Jesus and the recipient of special revelation. LIVING REMNANTS. Did any of the early Gnostic sects survive? Perhaps—in the tradition of the Mandaeans, a small religious group in southern Iraq and Iran. There is some reason to believe that they originated in firstÐcentury Palestine as a Jewish Gnostic sect. They speak a dialect of Aramaic, and the ritual of baptism plays a central role in their religion. In their view, John the Baptist was the true prophet, but Jesus was a liar and a sorcerer. The Mandaeans have been the focus of international news recently (“Save the Gnostics” said the New York Times) because their community has been an unintended casualty of the U.S. invasion of Iraq. Most of Iraq's Mandaeans have had to flee to other parts of the world. STILL POPULAR. 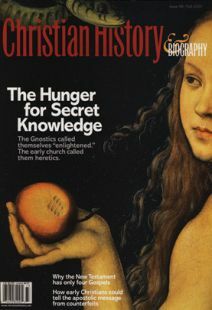 There are people who call themselves “Gnostics” today, such as the Ecclesia Gnostica (Gnostic Church) in Los Angeles, but their religion is an amalgam of beliefs rather than a true reflection of ancient Gnosticism. More common in today's culture are the movements and books that show the continuing influence of Gnostic ideas—such as Scientology, the New Age, novels like The Da Vinci Code, and even some aspects of psychotherapy.